WASHINGTON, D.C. — The team behind a student-led, private mission to Mars wants to send you to the Red Planet — for just 99 cents. Time Capsule to Mars (TC2M) is now offering anyone with a computer or cell phone the chance to upload a photo or other digital image to fly onboard its planned trio of 4-inch-wide (10 centimeters), Mars-bound probes for less than a dollar. As the project's name implies, TC2M hopes to deposit digital archives on the Martian surface for colonists to someday discover. Images can now be uploaded through the project's website at timecapsuletomars.com. Time Capsule to Mars founder and mission director Emily Briere speaks at the National Press Club on June 23, 2014. 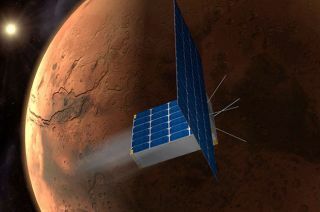 The TC2M team, including students from Duke, MIT, the University of Connecticut and Stanford University, aims to raise $25 million, underwriting development of the project's small spacecraft and financing its journey to Mars. "We hope this mission might be the first private mission to Mars," Briere said. "We hope it'll be the first interplanetary trial of ion-electrospray propulsion ... and we also hope it'll be the first student-led endeavor to [another] planet and first interplanetary CubeSat." "So we've got a lot of firsts," she noted. TC2M's fundraising campaign has also offered yet another possibility — setting a record for the largest crowdfunded initiative in history. "We were looking for opportunities to fund this mission in a way it would involve as many people as possible," said Jon Tidd, director of fundraising and marketing and a Duke University graduate student. "We came up with the idea of a simplified 99-cent upload for a single digital photo." At least one crowdfunded project, a space-based combat video game, surpassed TC2M's $25 million goal by raising more than $46 million to date. Eventually, TC2M plans to add the chance to upload other types of digital media, including audio, video and text. The data will be archived using "quartz storage" technology to ensure a long life for the time capsules on Mars. Details about the mission and the spacecraft's design are still being finalized, though TC2M will utilize other state-of-the-art technologies, including ion propulsion, "deep space internet" and inflatable antennas. If funding is secured, the team plans to launch the mission in the next five years. "We have a tentative launch date that we're not disclosing at this time," Briere told collectSPACE. "I was a product of the Apollo era and [through TC2M] we are handing that off to the next generation who will take us to Mars," said former space shuttle astronaut Charles Precourt, ATK vice president and general manager of the company's space launch division. "I am going to have my kids' and my grandchildren's photos etched on part of [TC2M]."